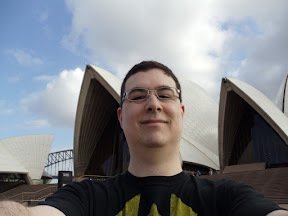 I was recently sent for a week to Sydney, Australia on business for a week. Having only been out of the US twice before (once to Aruba, and once to Canada, which doesn’t really count), I wasn’t really sure what to expect. Plus, it being a business trip, I didn’t expect to have much time for tourism. Luckily, we got a little more time than I expected to enjoy the area. When I left home, it was snowing and icy, enough that I had to take the train to the airport rather than getting dropped off. 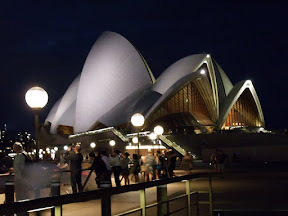 It’s the end of Summer in Australia, though, so I checked my coat with my luggage and made the flight to LA, where, after a six-hour layover, I got on the 15-hour V Australia flight to Sydney. The flight actually sounds worse than it is. V Australia has little individual screens in the back of each seat and a library of movies, TV, music, and games to entertain you. It wasn’t a short flight, but I had enough to keep me busy between that and my Kindle that the time went by faster than expected. I and my coworker, Derek, left on Thursday, February 24, at 11:40a and we got into Australia on Saturday, February 26, at 6:15a. You lose a lot of time on the flight, plus you cross the international date line, so you lose a day there. 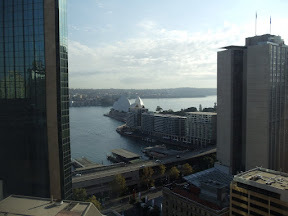 We took a taxi from the airport to our hotel, the Sydney Harbour Marriott at Circular Quay. We were lucky in that they already had our rooms ready, so we were able to check in and take a rest before heading out and taking advantage of our weekend for tourism. My room had a view of the Sydney Opera House, which made it very nice to wake up and peek outside in the morning. 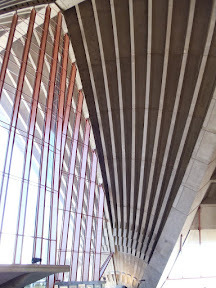 After dropping off our stuff, we headed over to the Sydney Opera House and took a tour of the inside, learning about the architect, Jørn Utzon, and the way in which it was constructed. It was a very interesting tour and you get to see a lot of stuff that you don’t normally see since most of the time the views are of the outside, not the inside. 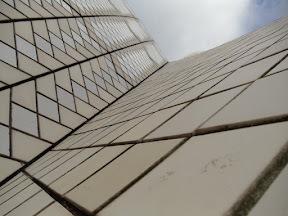 I think the thing that I found most interesting was the set of tiles on the outside of the Opera House. 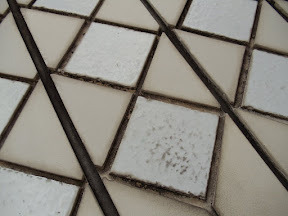 When you see it on TV, the Opera House looks totally white, but the tiles are actually a mix of white and cream color, so when you’re up close, there’s a different pattern to it. There are 1,056,006 ceramic tiles in a sort of chevron pattern. They’re self-cleaning, with the rain doing all the work. They’ve never had to replace a tile since construction completed in 1973. And there are no gutters on the building - the rain washes into the spaces between the tiles, runs down the outside, and back into the harbor. The rest of Saturday was spent sort of milling about the city, just getting a feel for things. We had lunch at the King Street Brewhouse, walked past the botanical gardens, but generally didn’t have a destination. The heat and humidity took some getting used to, with the air thick like molasses and having hopped pretty much straight out of snow and ice into summertime. Sunday morning I got up early and made it over to Sydney Wildlife World as it opened at 9:00a. It was a little cloudy and rainy, so the heat and humidity was accentuated quite a bit. Wildlife World was actually really cool and you get to see everything from butterflies (in an enclosure, flying all around you) to wombats and cassowaries. I got there as the koalas were being fed, so while normally they are asleep from 18-22 hours a day, I got to watch a couple grabbing eucalyptus branches and eating breakfast. 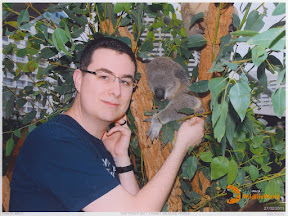 I also got to pet one of the koalas (named Sid) and get my picture with him. Finally, after the rain started settling down, they put some food out for the kangaroos and they hopped out to eat… and they let us pet the kangaroos, too. 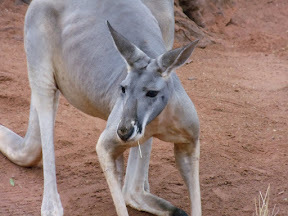 The kangaroo I petted was named Merv. (I didn’t get my picture with Merv since there was quite a line to come up and pet him, but I did get a picture of Merv.) The keeper in the exhibit mentioned that Merv has a pretty playful attitude and has been known to hop over the knee-high fence in the enclosure and wander around where the guests are. 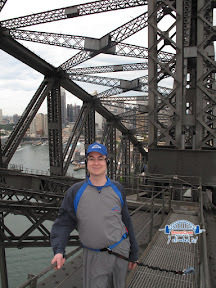 After Sydney Wildlife World, I headed up to The Rocks area in Sydney to do the Sydney Harbour Bridge Climb. It’s not a cheap endeavor, but it’s definitely worth the time and money. Derek went as well, and we had a group of five climbers (counting us and the tour guide, Simon). We went all the way up the bridge on the inside arch, climbed to the very top, and then came down the opposite inside arch. 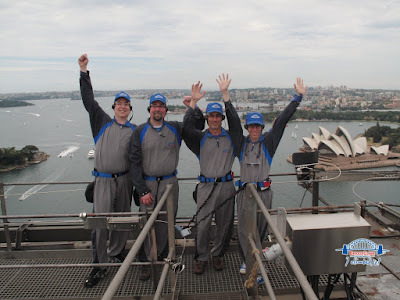 We got to see quite a bit about the inner workings of the bridge and the views of Sydney were brilliant. It’s reasonably exhausting, though, taking 1400 steps and burning roughly 500 calories (per Simon). We had lunch after the bridge climb at the Lord Nelson Brewery. I had a fairly tasty porter called “Nelson’s Blood” and a pizza with shrimp on it. We wandered around for a bit more, but after the bridge climb, we were pretty much toasted, so we took a break until dinner. 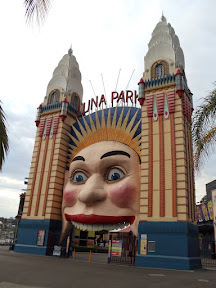 We thought we’d try the bar at Luna Park, since it’s supposed to have a nice view of the harbor, but they don’t really have a menu as such, so after having taken the train there, we caught the ferry back and had dinner at the Opera House Bar. Monday was our first day at work, but after work we headed over to Manly Beach on the ferry and had dinner at a local place, the Steyne hotel. At least, I think it was that; I am sort of blanking on the name of the place and Google Maps street view is telling me Steyne, so… there you go. Tuesday after work we headed out with another coworker, Mike, and we had dinner at The Local Taphouse. They have a ton of local beers and you can get a “tasting paddle” where you get a small amount of five different ones to try. I had that and probably one of the best burgers I’ve ever had in my life. Very good, highly recommended. Wednesday after work dinner was at Redoak Boutique Beer Café where I had some pretty tasty bangers and mash. We did a little more trinket shopping, but generally speaking, we took it pretty easy. Thursday was our last full day at work. After work we went out with our co-worker, Tim, who makes the trip regularly. He showed us a nice place called the Belgian Beer Café for dinner, where I tried kangaroo. Tastes a lot like beef. Friday being our last day (well, half day, since it was primarily travel), I got up early, had breakfast, and made one last trip around the Circular Quay area and the Sydney Opera House again. Then… train to the airport and the long flight(s) home. My “I never travel” uneducated impression: Sydney really reminds me of a combination of Portland, Seattle, and Victoria BC. I felt very much at home walking around, the city looked like walking around downtown Seattle, and some of the historic buildings felt a lot like Victoria BC. It was a laid back atmosphere, nice and easy going. Oh, and there’s a nice bridge (like Portland!) and an Opera House (well, not like Portland). I had a great time checking things out and saw a lot of things I’d never seen while still being in a comfortable, familiar environment. 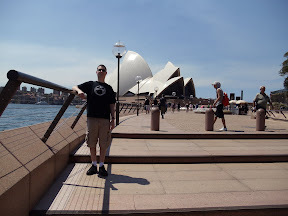 I will definitely have to go back someday on vacation and spend more time not only seeing things around Sydney but also venturing out to other locations around Australia. I posted a bunch of pictures of the stuff I saw over in Picasa (but only a fraction of the 550+ photos I took). Go check that out if you’d like to see more. « Who's Your Favorite Bond?